Whether you want to call them Doughnuts or Donuts, these yeast based snacks are the ultimate bomb dot com. There are more than one type of doughnuts, but the two most common versions are yeast donuts and cake doughnuts. In our household, we definitely prefer the yeast doughnuts. Particularly the ones that require deep frying. They’re just that little more sinful and that little more tasty. One particularly weekend, I was feeling exactly that. Sinful. I also desperately wanted to eat doughnuts, but had no where to go to buy them. So I did the next best thing. I made some. And then I slathered them with Nutella and peanut butter. Chunky peanut butter. Oh yeaaaaaaaah! The recipe is simple enough to follow and the deep frying wasn’t as difficult as I imagined. All you require is a little bit of patience, ingenuity and you will be able to sink your teeth into these beauties as well. I need to invest more time in coming up with more flavours and frosting. This is the quickest and easiest cheats version and literally takes less than hour! It also rewards you with doughnuts and doughnut holes (a.k.a. Munchkins; a.k.a. Timbits, depending if you are a Dunkin Donut or a Tim Hortons brought up child). Start with combining the yeast, water, milk and sugar into a mixing bowl and set aside. Once the yeast mixture starts bubbling up (around 5 minutes), in a stand mixer, add in the egg, butter, cinnamon, vanilla bean paste, salt and half the flour with a dough hook attachment. Once the mixture starts to form a dough texture, add in the remaining flour and keep mixing until the dough starts to pull away from the bowl. Transfer to a well floured surface to knead with your hands. 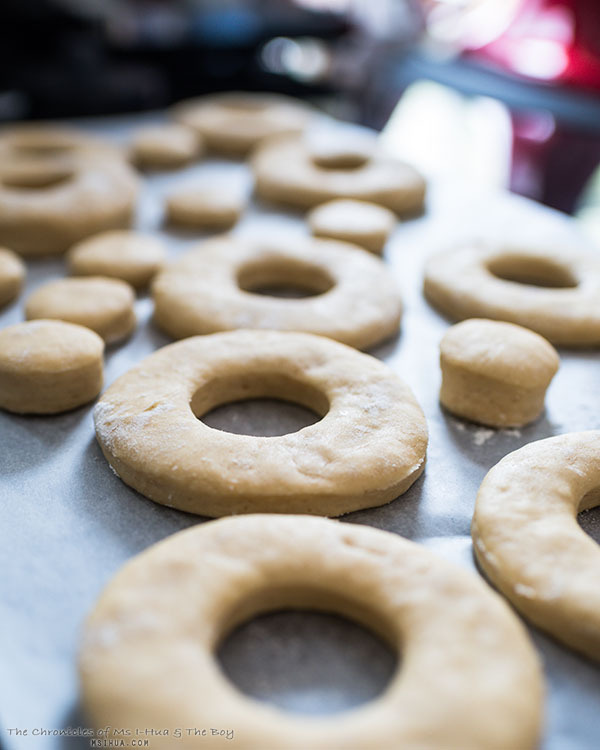 Roll the dough out to a flat surface (1/2 inch) and using two round cookie cutters (one large and one small) to cut the doughnut shapes into the dough. 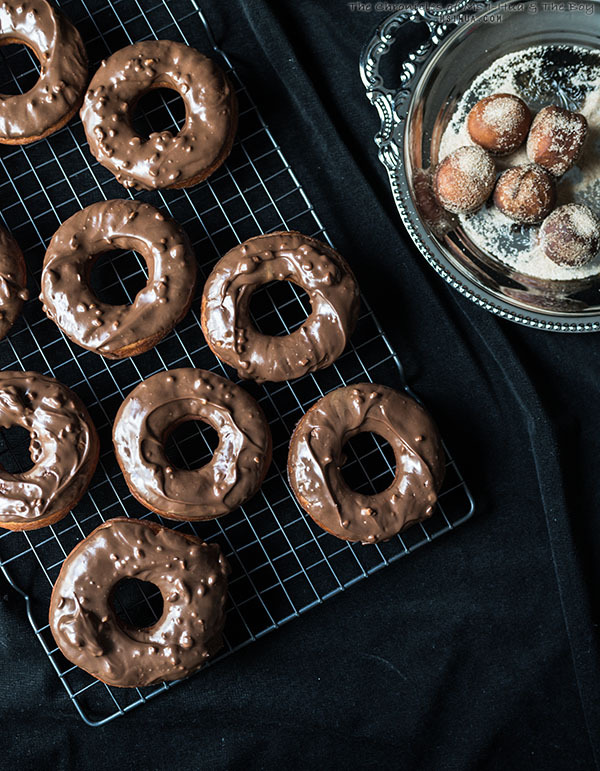 With the discarded dough, keep rolling the dough out until all the dough has been used to form doughnut shapes (you should have about 9-12 doughnuts from this if you are using a 5-inch (12 cm) sized cookie cutter for the large outer rings). Allow the dough to rise on a floured surface (around 30 minutes). Once the dough has risen, heat up the oil in a saucepan or deep fryer. Once the oil reaches 180 degrees Celsius, carefully drop in a doughnut ring and fry until a golden brown before turning it over. 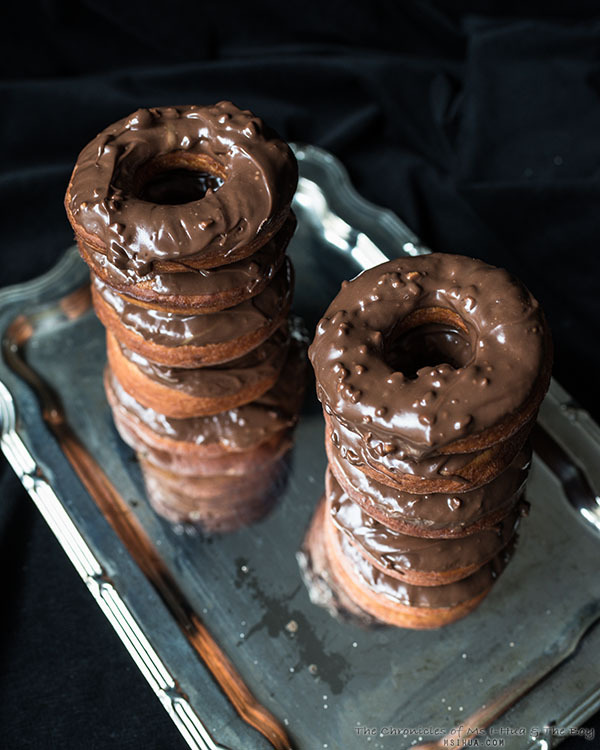 Remove the doughnut from the oil and place atop absorbent kitchen towels on a wire rack to cool. I find using a pair of wooden chopsticks for this activity very helpful. 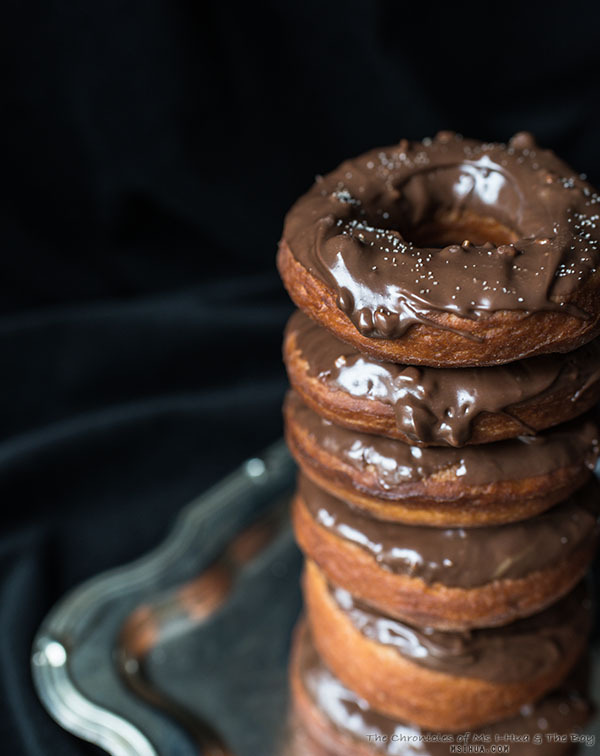 Once all the doughnut rings and doughnut holes have been fried, start preparing the nutella and peanut butter glaze. In a bowl, place 3 spoonfuls of Nutella and chunky peanut butter (each) and pop into the microwave for 10-15 seconds. The point is to melt them slightly, not to turn them into a liquid based (if that happens and you go too far, just let it cool down). 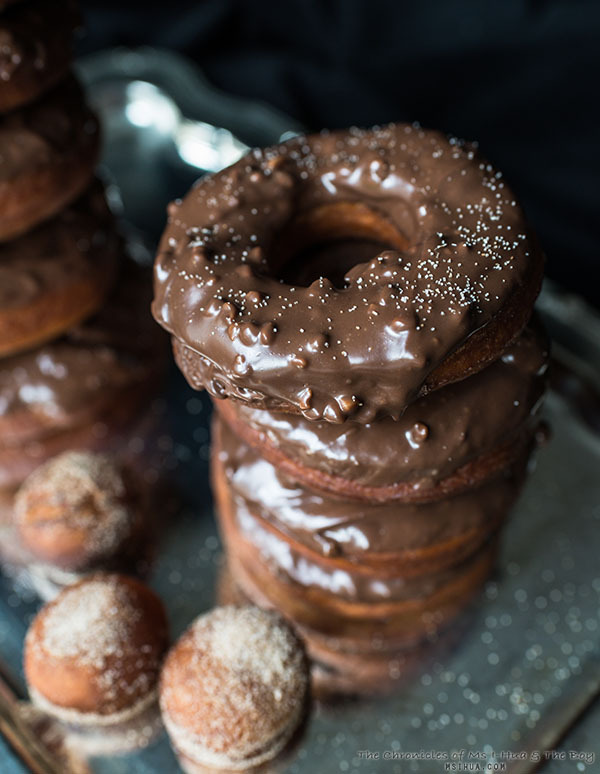 To glaze the doughnuts, take one end of the doughnut ring and dip into the Nutella and Peanut butter mixture and swirl it before carefully turning over to rest on a wire rack. Do this until all the doughnuts are completely glazed. 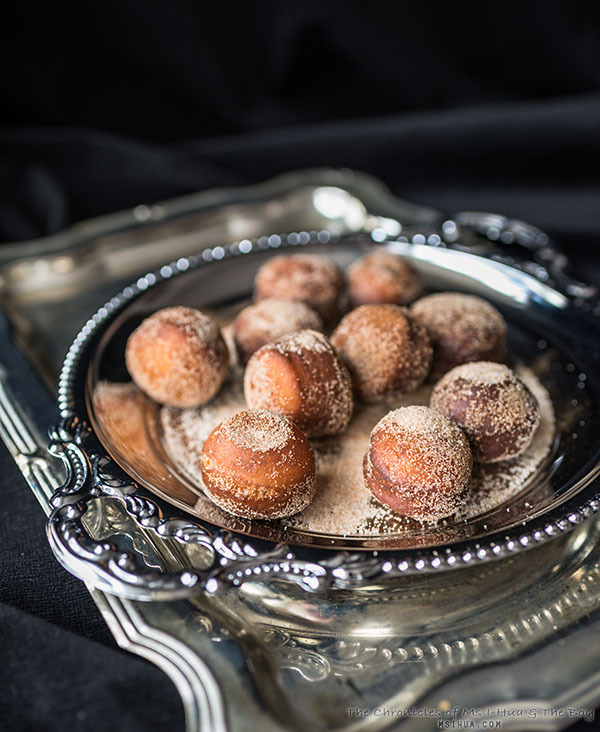 With the doughnut holes, toss them into a cinnamon sugar mixture until fully covered (do this whilst the doughnut holes are warm, so that the cinnamon sugar sticks to the dough). What are you waiting for? This recipe is so easy and rewarding. 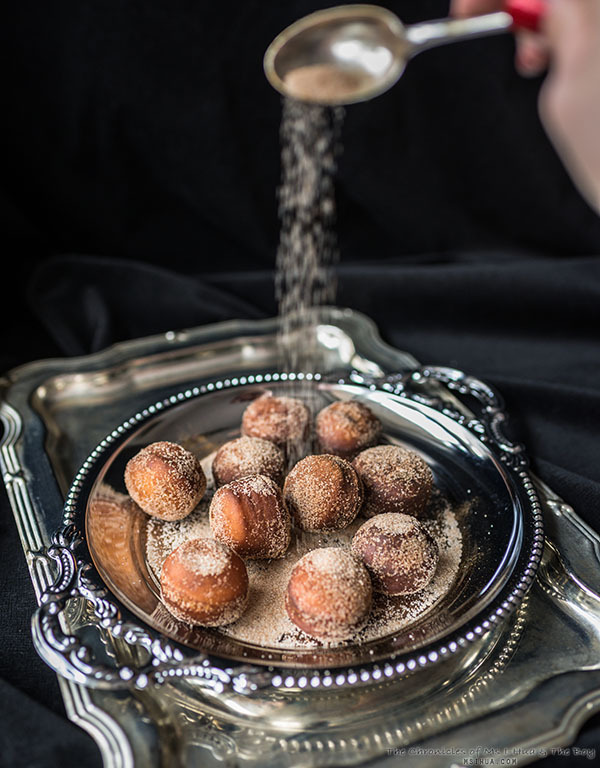 You get to indulge in both the doughnuts and doughnut holes! Not helping my cravings for donuts! I think there will be a late night 7Eleven run for me! So rich and creamy and irresistible. Great recipe, thanks for sharing! !